Today marks an anxious anniversary of sorts—grave for many reasons, but in no small part because we do not yet know the full consequences of the event we’re reflecting on. We cannot know because it is still unfolding and, whatever the effects are, we are still in the middle of it. One year ago this evening, as the presidential election results rolled in, Oscar and I texted each other. What should we do, I asked? You should write something, Oscar answered. So on November 17, we sent out a letter. We called it the Solidarity Letter, and we hoped it would serve not only as a way of communing with all of you—our friends, colleagues, contributors, and readers—and reaffirming a set of core ideals (equality and dignity for all, freedom of the press, democratic principles), but also as a statement of intent and purpose as we looked to the future. Ever since the election—without exaggeration, every day for the past year—we’ve been working to create a Resistance Issue, and on December 1st we’ll share it with all of you. 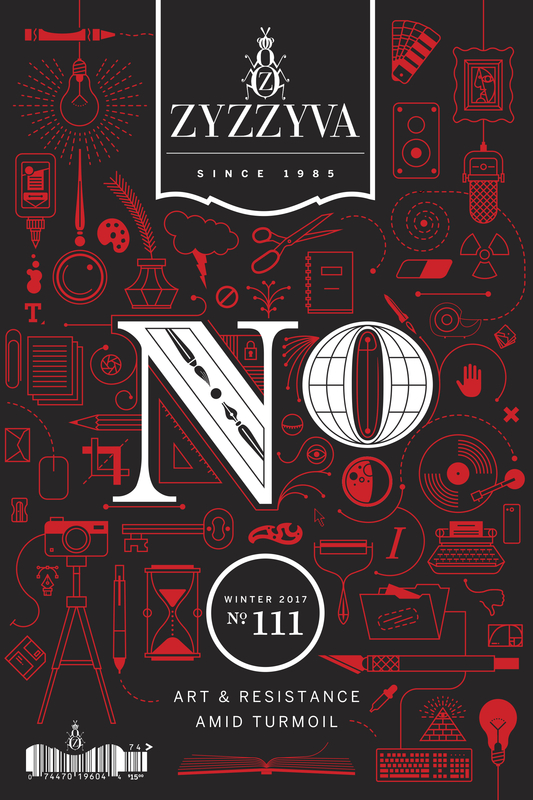 As we’ve shaped the issue, we’ve shaped our evolving vision for the journal, too. It’s our belief a literary journal can and should be engaged with a world in tumult; we can offer both respite from the often vapid noise of a 24-hour news-cycle and relentless partisanship, and, at the same time, invite deeper, more thoughtful engagement with the most urgent questions facing our culture and our country. We believe there is a role for this journal to play in the current environment, and that we can do so without diminishing our commitment to our foundational cause of contemporary art and literature. We believe we can curate a conversation elevated above party loyalty, one that is thoughtful even when it is provocative, which dares to be both idealistic and intellectual, informed as much by poetry as it is by history. The forthcoming Resistance Issue asks many questions about art, culture, and political engagement, and endeavors to offer a few ideas for consideration. The robust special section is comprised of essays by Troy Jollimore (on how Wallace Shawn’s work illuminates our predicament), Robin Romm (on what Imre Kertész teaches us about art as resistance), T.J. Stiles (on the road we travelled to arrive at this precarious moment), and Andrew Tonkovich (on “free persons” and writing), as well as poetry by Victoria Chang, David Hernandez, Dean Rader, and Ruth Madievsky. Beyond these themed pieces, the issue also includes stories by Kristopher Jansma, Dana Johnson, and Krys Lee; an excerpt from Dorthe Nors’s forthcoming novel; poetry by Judy Halebsky, Bino Realuyo, and Jenny Xie; and a riotous conversation between Matt Sumell and Michelle Latiolais on writing, mentoring, and anger. And it’s all bound up in an exquisitely-crafted, illustrated cover by Josh Korwin—a piece of art in and of itself; one evocative of these strange times. Please join us as a subscriber and guarantee yourself a copy of this landmark issue of ZYZZYVA. We hope you’ll take part in the community and conversation we’re striving to curate. In general, we keep partisanship and day-to-day politics out of the journal. We hope we can provide a space for thoughtful contemplation of all aspects of contemporary life through art—a way of thinking which, while engaged with the political, is not political in its mode and does its work well outside the 24-hour news-cycle. But we are now compelled to speak to you directly about this election. On November 8, this nation succumbed to the greatest threat that faces any democracy: that a sizable number of its people may find democracy itself—with all its imperfections—too unpalatable, and choose instead to surrender their agency to a strongman. This nation has elected a boastfully ignorant, vulgar, deceitful, professionally unqualified bigot. There will be much to write and discuss and agonize over in the days, months, and years to come. There is an abundance of blame to go around. There is much work to do. But before we move forward, we’d like to address that which feels most urgent at this moment, and most relevant to what we endeavor to do here at ZYZZYVA. We believe Donald Trump’s candidacy has cultivated a new strain of fascism and that he has displayed autocratic tendencies. We believe this because we have listened to his words, and paid attention to his actions. He has told the American people repeatedly how little respect he has for basic tenets of our democracy such as a free press and an independent judiciary—and we believe him. He has told us repeatedly how little respect he has for civil liberties, and we believe him. He has told us that he holds women and immigrants in contempt, and we believe him. And now we have seen him select Stephen Bannon, a leading figure in the white-nationalist movement, documented anti-Semite, and enormously effective conspiracy theorist and propaganda creator as his chief-strategist. In order for those Americans dismayed by this election to organize an effective resistance to the incoming administration, we must clearly acknowledge the magnitude and character of the problem we face. This extraordinarily distressing moment is, of course, personal for so many of us. For our small staff, as in so many communities around this country, the election of Donald Trump reverberates as a stunning rebuke. We are both the proud children of immigrants, and we are feminists; one of us is Jewish, the other is Mexican. For us as for so many other immigrants, ethnic and religious minorities, the disabled, for survivors of sexual assault, the LGBTQ community, for feminists, the message seems clear: the new president and an untold number of his supporters do not see us as Americans. Our disappointment in this outcome has nothing to do with traditional politics—liberal versus conservative—and everything to do with the still radical ideals of individual freedom and equality on which this country was founded. They are ideals we’ve never perfectly achieved, but for which each generation has fought and for which we will now continue fighting with renewed focus. Those of us committed to defending civil liberties and a free press—and to resisting any action by the new administration that threatens those ideals—may feel like outsiders, out of step with much of the population, not to mention the party now dominating the federal government. But we are in fact picking up the torch for American ideals. Our shared hopes are profoundly democratic, and profoundly American. We must not let this latest chapter in a long struggle make us feel like outsiders in our own home. We must remember that our participation in this difficult battle makes us American in the best sense of the word. For all of you who are justifiably afraid of what the future holds, for all of you who feel rejected by your country, where you and your parents or grandparents have worked so hard to build good lives: we share your distress, and we are with you. We share your grief, your anger, and your worry. ZYZZYVA has never been just a journal: it has always been about community. If you are looking for solace and solidarity as we all take a collective breath and begin to figure out what to do next, please know we are with you. If you’re looking for a safe haven, we hope you may find it in the community we’ve built here in the pages of the journal, where we will vigorously defend the First Amendment as we expand our nonfiction offerings; you’ll find it at any of our events where we can gather to share ideas and concerns; and you’ll find it on our online community of readers, writers, and artists. We’ll work to create even more opportunities, both in the journal, online, and in events, to foster dialogue and analysis of our changing political and cultural climate as we try to answer, What do we do next? Camus wrote of “the generosity of rebellion,” a kind of rebellion “which unhesitatingly gives the strength of its love and without a moment’s delay refuses injustice. … Real generosity toward the future lies in giving all to the present.” Just so, let us give our all to the present. Keep making your art. Literature can do so much to shed light on the dark corners where the complex convergence of factors that led us to this strange and troubled time festered, and continue to fester. We need that light more than ever. We’ll do everything we can in our own tiny corner of the universe to make sure your voices are heard, your rights are protected, and our community is inclusive. We don’t normally reprint letters from the editor here, but on the eve of Issue No. 100’s publication date, we’d like to share with you our thoughts about the journal—why we think the work is important (and why its print format is essential), and where we hope to take it. Ours is an era of profligate noise. Content and images clamor for our attention at every turn, in every medium. Opinion masquerades as information; information floods our senses. Distractions abound. The cacophony is merciless, and rapid fire. At times it seems a literary journal may be hopelessly out of step with contemporary culture. It is a radically unhip project; a gentle kind of counter-cultural movement. Yet our endeavor here at ZYZZYVA answers an urgent need in this time and place—and here in San Francisco, at the relentlessly energetic heart of technological innovation, we have a distinct perspective on that need. We risk becoming strangers to ourselves amid this noise. It is all too easy, too seductive, to succumb to a perpetually distracted state. We need a space for quiet, for reflection. We need room to recognize what is meaningful, to linger for a moment in quietude, in sadness, in uncertainty, in joy. From our offices in downtown San Francisco, we believe we are producing a literary journal that provides such a space. Since we started in 1985, our offices have moved from one city locale to another, but our view on the world has always been, and will remain, a distinctly San Franciscan perspective. Fueled by all that our greatly diverse, culturally driven city has to offer—an international yet American community; a place of wealth and prospects as well as poverty and despondency; a marvel of natural beauty and a landscape of urban grit; comical and heart-rending, imperiled and brave—we embrace our mission: to publish art and literature that speaks to the deepest wells of life’s struggle and joy, that acknowledges the mysteries of existence and sifts for glorious moments of revelation. So now, at 100 issues in, having persevered through many a difficult time and many a close call, our hope is to keep this journal thriving and vibrant for as long as we can. With your help, we will continue the project that our founding editor’s vision and labor began, and honor this unique institution, the inimitable publication that introduced readers to Haruki Murakami and Jim Gavin; the journal of Richard Diebenkorn and Sandow Birk; of Kay Ryan and Sherman Alexie, Raymond Carver and Adam Johnson, Wanda Coleman and Elizabeth Spencer. In an environment crowded with dazzling and questionable new technologies, ZYZZYVA asserts the cerebral and tactile pleasures of reading, of holding a well-bound book in your hands, of losing—and finding—yourself in the pages of a story. We value the technology of print and the way words on a page remove us, if just for a moment, from more immediate interaction with the rest of the world, allowing an incomparable depth of concentration. We assert the value of the solitary reader, communing with humanity through text, through literature; and we will continue to do our part in fostering a culture that brings writers and readers together, to convene in the same room and share ideas. We hope you will join us in celebrating 100 issues of preeminent and daring literary publishing, of Pulitzer winners and poet laureates, of the finest contemporary minds and astonishing raw talent, and twenty-nine years of cultivating a cultural community around the arts and letters. Welcome to the new ZYZZYVA. After 26 years we’ve given the journal a new look, even a new heft. Over the past months we’ve worked on a redesign with Three Steps Ahead, the same California firm behind our new website. ZYZZYVA’s original print design, created with care by Thomas Ingalls & Associates in 1985, was elegant and restrained. We kept in mind the clarity and the spare beauty of their vision as we sought to add other elements speaking to the pleasures of print, to the craft of bookmaking, and to the stimulating quietude of reading. We considered paper weight and tone, typesetting and titles, mingled serifs with sans-serifs, discussed the old-fashioned whimsy of endpapers—always with a view toward presenting stories, poetry, and art in the best way possible. Perhaps the most dramatic shift is in our cover design. This new presentation of cover art evokes how a work is thoughtfully displayed in a gallery or museum; the shadowing effect playfully reproduces the quality of a piece hanging on a wall. This nod to gallery exhibitions reflects our intent: to present the artwork we curate with the same attentiveness we bring to the literature we publish. This issue features yet another vital development in our commitment to the visual arts: the journal’s first-ever full-color art spread. We are thrilled to inaugurate this new feature by showcasing stunning photographic portraits by Katy Grannan and striking paintings by Julio Cesar Morales. Our primary focus is, as always, on publishing the highest quality art and literature; design is secondary, and must serve the content. But in this digitally driven age, it is incumbent on any publisher to consider all aspects of a print product, including the physicality of the object, and to answer fully a book reader’s implicit (sometimes explicit) query: why should I spend time with this journal? Our implicit (now explicit) answer to you: because it offers a feast of contemporary poetry, prose and art. Because each issue seeks to be unexpected, fresh and affecting. Because your time is rewarded with our vigorous attention to every detail of the reading experience. And not least of all: because this journal is also a beautiful object—one that, we hope, is pleasing to the eye, pleasing to the touch, and takes a place of pride and enjoyment in your home. We imagine ZYZZYVA on your coffee table, your bookshelf, your nightstand, there in a stack of other books by the bed or on the desk. And we hope that every time your gaze falls upon it you’re reminded anew of the sensory and cerebral pleasures of print.